OTTAWA — No matter who is the head coach of the Ottawa Senators, the position doesn't seem to include much job security. When the Senators fired Guy Boucher on Friday and replaced him with Marc Crawford on an interim basis, it marked the ninth coaching change the team has made since parting ways with longtime coach Jacques Martin after the 2004 season. JUNE 8, 2004: The Senators hire former Anaheim Ducks general manager Bryan Murray as head coach to replace Martin. A native of nearby Shawville, Que., Murray left his post with Anaheim to go back behind the bench with Ottawa. Murray, who had previously coached in more than 1,000 NHL games, was hired by then-GM John Muckler. Murray guided the Senators to the Stanley Cup final in 2007 before Muckler was fired. Murray was then named GM. JULY 6, 2007: Murray promotes assistant coach John Paddock to head coach. Paddock had previous head coaching experience with the Winnipeg Jets and AHL's Binghamton Senators. "I never considered John as an assistant coach. I considered him a partner," Murray said. FEB. 27, 2008: Murray fires Paddock one day after the trade deadline and puts himself back behind the bench, despite the fact the team was second in the conference standings. The Senators were coming off two shutout losses. The Senators went on to be swept out of the first round of the playoffs by the Pittsburgh Penguins. JUNE 13, 2008: Murray hires Craig Hartsburg as head coach. Hartsburg spent the previous four seasons as head coach with the OHL's Sault Ste. Marie Greyhounds. He also had head coaching experience with the Chicago Blackhawks and Anaheim. ''It appeared to me that one guy thrived on the scrutiny, thrived on the pressure and wanted to be in Ottawa,'' Murray said. ''I had a comfort level and, at the end of the day, I thought that was the way to go. FEB. 2, 2009: Murray fires Hartsburg and replaces him with Binghamton head coach Cory Clouston on an interim basis. Hartsburg lasted just 48 games in the role and left with a record of 17-24-7. The team went on to miss the playoffs for the first time since 1996. APRIL 8, 2009: Murray removes the interim tag from Clouston, signing him to a two-year deal late in the season. ''Cory's come in and done a remarkable job really,'' Murray said. ''He's made (the players) accountable. APRIL 10, 2011: Murray fires Clouston, who made the playoffs and lost in the first round in 2010 and then missed the following season. ''In hockey, in sport, and professional sport in particular, the point guy is the coach most of the time and so you point the finger sooner at him than at other people ... We made that decision some time ago,'' Murray said. JUNE 14, 2011: Murray hires veteran Detroit Red Wings assistant coach Paul MacLean to guide the Senators. MacLean was previously an assistant coach with Murray as GM in Anaheim. DEC. 8, 2014: Less than 18 months after being named coach of the year, MacLean is sent packing by Ottawa. The move came after an 11-11-5 start. Assistant coach Dave Cameron was promoted to head coach. Murray said there was an "uneasiness" in the dressing room under MacLean, who made the playoffs in two of his three full seasons. "Some of the better players felt that they were singled out a little too often maybe," said Murray. "That's today's athlete. They want to be corrected, coached, given a chance to play without being the centrepoint of discussion in the room." It was the last coaching change Murray would make as GM. He died after a battle with cancer in 2017. APRIL 12, 2016: The Senators fire Cameron, who had worked for team owner Eugene Melynk at the OHL, AHL and NHL levels. In March, Melnyk went public with criticism of Cameron for his decision to start rookie goaltender Matt O'Connor in the home opener. He called it "stupidity." "It was hurtful and I didn't think there was any need of it," said Cameron, who made the playoffs once with Ottawa. "I felt like I was fired for three weeks. Every day." MAY 8, 2016: The Senators hire former Tampa Bay Lightning bench boss Boucher as head coach. 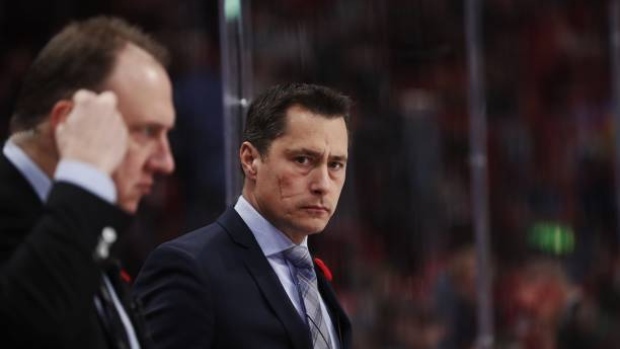 New Senators GM Pierre Dorion said Boucher was the first candidate he interviewed for the position and was his front-runner for from the start, countering reports that the team was snubbed by new Minnesota coach Bruce Boudreau. "I want to make it clear to everyone that this was my candidate," Dorion said. "No doubt in my mind, from the first time that I met him I felt this would be the guy to lead the Ottawa Senators." MARCH 1, 2018: The Senators fire Boucher, just days after saying they would support him after trading away their top three scorers.